"My kids have been patients here for over 15 years. All of the Doctors are wonderful." "I have high expectations. I finally found these wonderful doctors and they are perfect!" "I have been trusting this office since I've had my kids. They are great pediatricians." "We spent so much time looking for a pediatrician, and this has been the best." Families in Houston can get all of their child’s medical needs met under one roof at Pediatrics of Southwest Houston. The team at this pediatric medical facility near Meyerland, Gulfton, Braeswood Place, and Bellaire, Texas, accepts all children — from newborns to teenagers. These pediatricians, as well as their team of medical professionals, are available for an array of health and medical needs. One of the most common types of appointments offered at the practice is a routine checkup. This is when a patient’s dedicated physician reviews the child's growth, diet, and development and makes recommendations to keep the child healthy. These physicals are complete and detailed and include the requirements for school and sports physicals. Vaccines will be reviewed and updated during the physical. Our providers specialize in treating asthma, ADHD, sore throats, seasonal illnesses, and obesity, to name a few conditions. No matter what a child’s needs may be, the caring team at Pediatrics of Southwest Houston can surely help. The practice is currently accepting new families who need to become established with a primary care pediatrician. Most of our staff speak both English and Spanish. 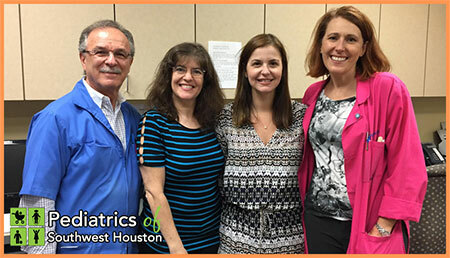 Pediatrics of Southwest Houston is proud to have served Houston's international community for 40 years. Whether you were Texas born and bred or have come to Houston from across the world, we welcome you to our practice and want to make our office your child's medical home. We strive to mix up-to-date, evidence-based medicine with old-fashioned caring and patience as we take our time to listen to you and your child, do a thorough physical exam and answer all of your questions. We want to form a partnership between our patients, their parents, and our staff, all working together to enable the healthy development of each child to his or her full potential. Welcome to our practice and to our family. Pediatrics of Southwest Houston is a member of the Harris County Medical Society and the Texas Medical Association, the largest county and state medical associations in the nation, committed to improving health for all Texans. Please click below to receive remote support. At Pediatrics of Southwest Houston, we accept most major insurance plans. Here is a list of some of the plans we accept. Please contact our office if you do not see your insurance provider listed.